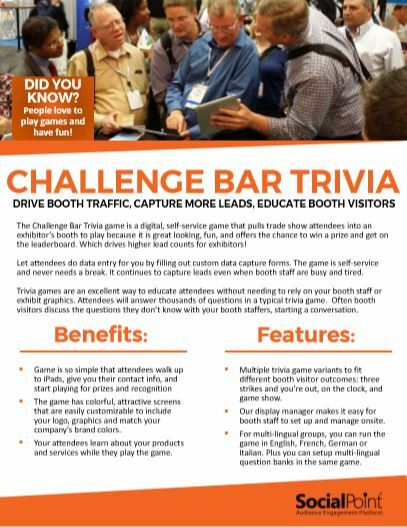 Learn more about how our Challenge Bar Trivia game can boost your trade show results. Get a pdf to read the details and share with your team. Complete this form to receive a digital download of the Challenge Bar Trivia game brochure. Review and share with your colleagues! More traffic, more learning, more time spent in your booth, easier conversations, and a crowd that attracts a crowd! Attendees learn about your products and services and start talking to your booth staffers while they answer your customized trivia questions.